PowerAMP Beta Available for Android! 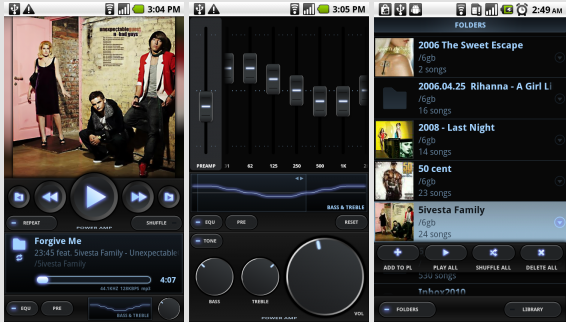 After all the recent press regarding WinAmp for Android, now comes PowerAMP! An alternative music player, PowerAMP is in beta and was brought to our attention by XDA forum member owziee. PowerAMP beta has received very good feedback in owziee’s discussion thread, and has attracted the attention of the actual developer MaxMP, now an XDA member. The app supports various formats including mp3, mp4/m3a, lossless ALAC, FLAC,OGG,WAV,TTA, WMA, is skinnable (2 are available in the beta version), has a widget and fast scans files dependent on mobile device speed. The dev mentions that this is a pretty early beta version, which was originally only released to internal Russian sites for early limited core functionality testing. To download PowerAMP beta, head to this post in the original discussion thread. You can also view MaxMP’s first post here.